Designed to attract big sports bike enthusiasts and to keep BMW alive in the fiercest of markets, the Kl has succeeded on all fronts largely because if is so different. 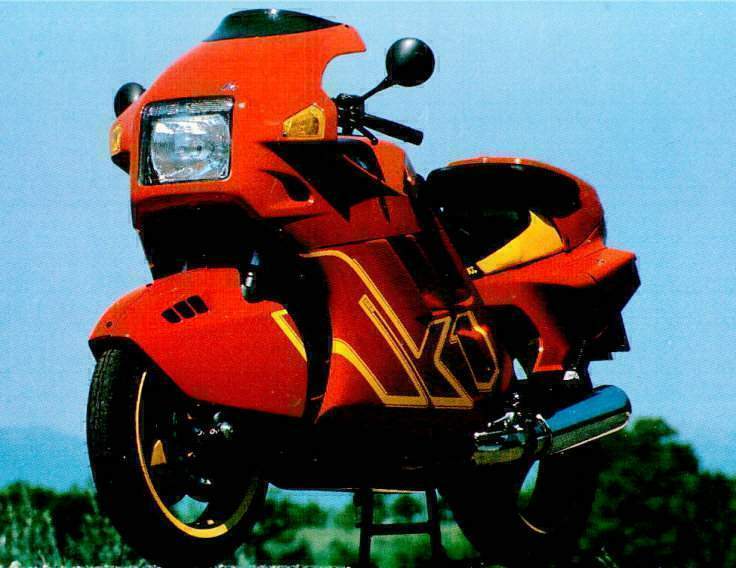 The bike's distinctive bodywork, including the virtually-enclosed front wheel and bulbous tail section, is designed to make it aerodynamically efficient. Viewed head on, the bike presents a huge frontal area but this tapers away to the rear tail hump and gives an impressive drag coefficient of .38, a figure better than any other currently produced motorcycle. 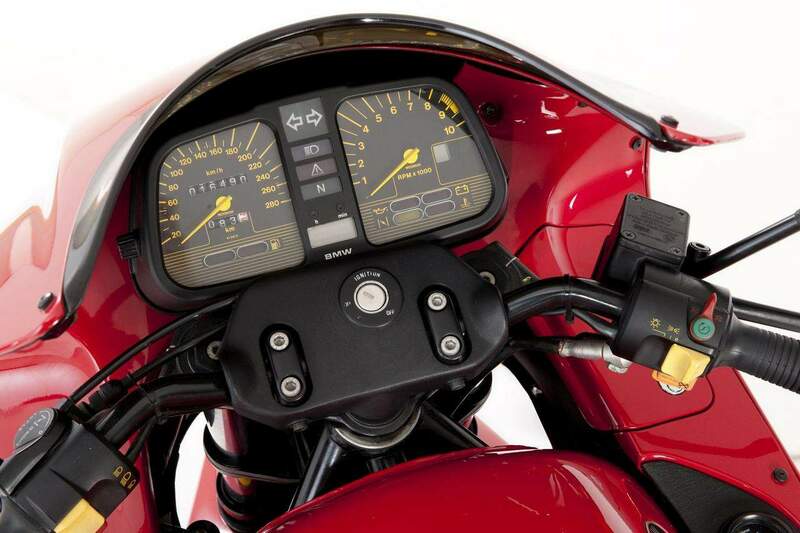 Its slippery shape helps it maintain a fop speed in comfort for the rider, who is well-protected from the wind-rush. BMW needed an aerodynamic advantage because, in Germany motorcycle horsepower output is limited to a maximum of l00bhp. 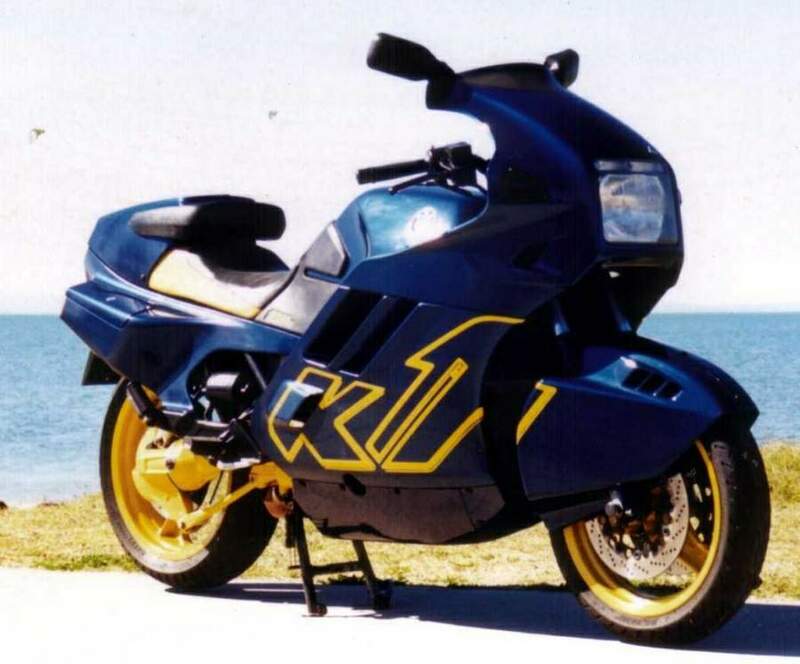 The 1984, four cylinder K100 engine was extensively revised, doubling the number of valves to 16, reworking the combustion chambers and lightening the crankshaft, con rods and pistons, so the unit revved harder. Perhaps the most important change was the adoption of the Bosch Motronic digital engine management system as fitted to BMW cars. This combines control of the fuel injection .and ignition systems giving enhanced response, ample power and good fuel economy. To match their new genuine 100 hp engine, BMW built a fine rolling chassis. The frame is uprated from the K100 series in that, although the engine still forms part of the frame with the single rear suspension arm pivoting on the casings, the frame tubing is in larger diameter tubing and the bike has a longer wheelbase and shorter trail. The Paralever single-sided arm is articulated to avoid driveshaft torque reaction. For front suspension and brakes, BMW fitted some expensive Italian components. The large diameter front forks are made by Marzocchi. 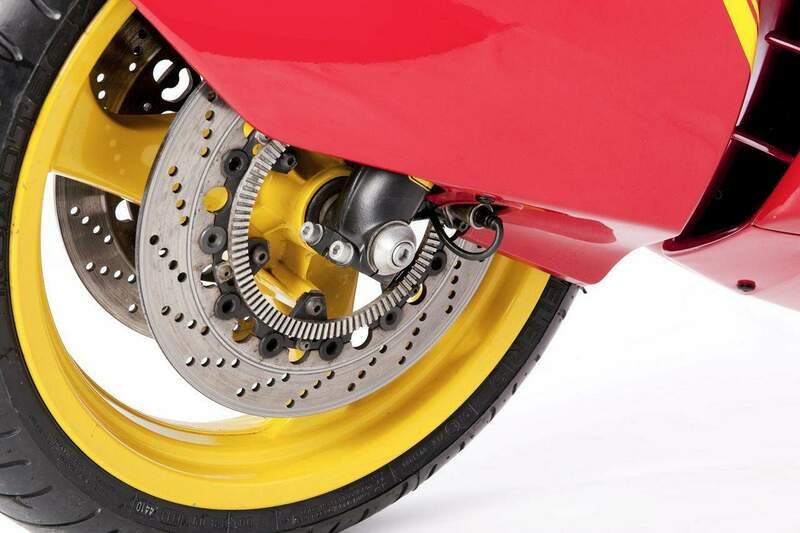 The brakes - large 305mm floating discs gripped by four-piston calipers - are by Brembo. 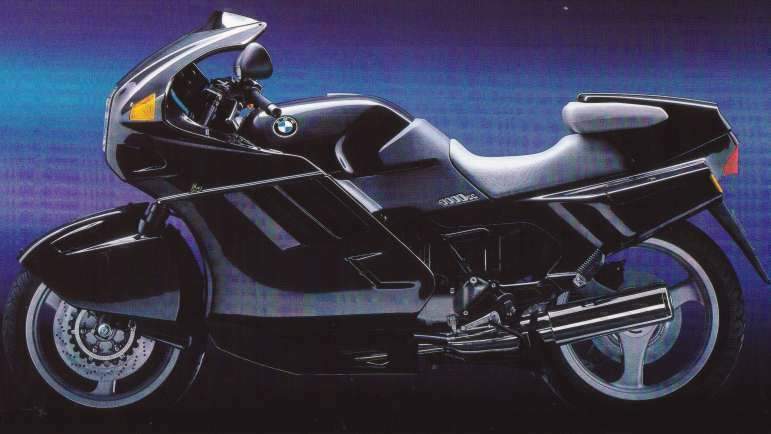 In addition, the bike comes with BMW's own, exclusive ABS or anti-lock braking system. Electronic sensors monitor the comparative speed of front and rear wheels and releases brake pressure up to seven times a second, preventing possible lock up of the wheels. The ABS system is a boon to road safety and BMW are still the only manufacturer to have put ABS into production. It's been an option on oil their big bikes since 1988. .Using the widest wheels ever fitted to a BMW, the Kl responds \o being ridden aggressively. Despite an enormous wet weight of 5701b, the bike is surprisingly nimble and easy to ride. Its forte is the wide open, fast rood where its effortless max "nun speed can be fully exploited. It remaps a special kind of motorcycle. Originally only 2,500 were to be built but worldwide demand means the production figure is more. The Kl is the only BMW ever built that's unable to carry hard panniers (the swoopy tail section prevents fitment though BMW do offer a soft luggage system that occupies the pillion seat making the Kl a true solo sportster). 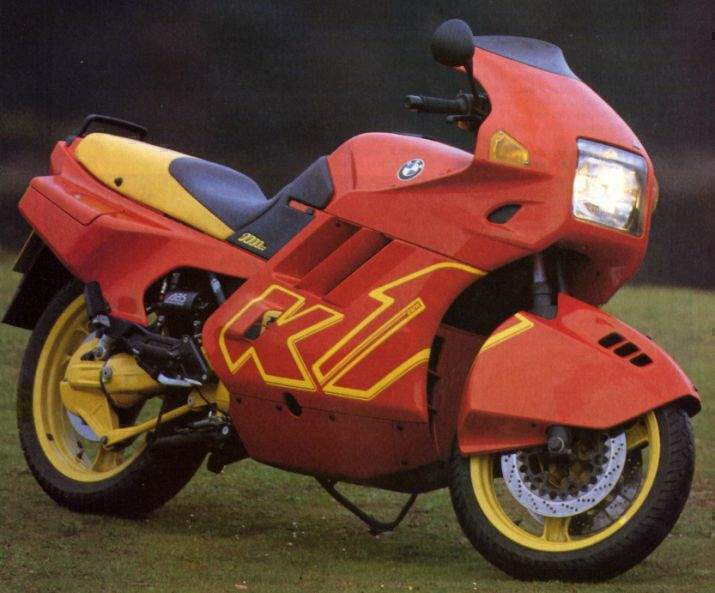 In response to demand from their traditional touring customers, in 1990 BMW released a 16-valve version of the K100RS. This bike can carry hard panniers. Apart from bodywork and styling, its specification is virtually identical to the Kl even though it looks nothing like it. As a modern superbike, the Kl stands alone - proud, defiant and very different.